Invisalign treatment continues to be one of the most popular options for straightening crooked teeth. The Invisalign aligners can be used throughout the day as a low visibility alternative to traditional bracing products. But many Invisalign users struggle with maintaining their braces and their Invisalign trays. Within this latest post, we’ll present our expert guide to maintaining your Invisalign trays. One option for keeping Invisalign trays in peak condition is the use of mouthwash. By soaking your Invisalign trays in mouthwash, you can clean most of the common contaminants that you’ll find on the trays. Remember to use a clear mouthwash to prevent discolouring your tray. Another great option for cleaning your trays is hydrogen peroxide. While most people don’t generally have this product in their home, it can be found at your local pharmacist. Make a solution with half hydrogen peroxide and half water and then let the trays soak in the solution for 30 minutes. When you take your trays out, they should be spotless and bacteria-free. One great, cost effective way of keeping your Invisalign trays completely clean is the use of vinegar. Vinegar is the all-purpose product for deep cleaning around the home, and it can be used as part of a half vinegar, half warm water mix for exceptional cleaning of your trays. Keep trays within the mixture while you’re eating and then simply place them back in when you’re done. While you might experience a slight taste of vinegar at first, this will diminish quickly. The Invisalign company sells their own cleaning kit, which can be used for a deep clean of the trays. While the kit is more expensive than the other cleaning methods, it can be used to ensure all bacterial remnants are removed for a completely clean tray with no aftertaste from the cleaning process. While most associate the use of Polident with cleaning dentures, the product can also be harnessed to maintain Invisalign trays. 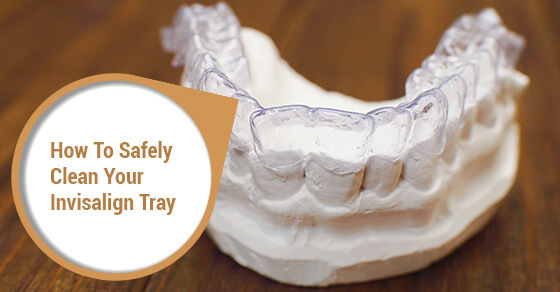 Trays should be soaked in the denture cleaner for about 15 minutes a day to keep them completely clean. It doesn’t take long to ensure safe and healthy use of Invisalign! Our expert oral health team is ready to help you ensure optimal cleaning of your Invisalign trays. To learn more tips for this complex cleaning process, contact our office team now!